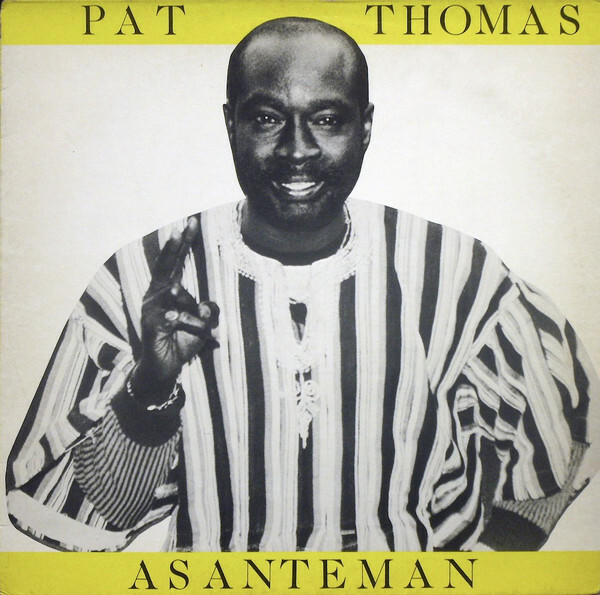 Pat Thomas- “The Golden Voice Of Africa” and Ghanaian Highlife Master. All Pat Thomas ever wanted to do was sing highlife, and he’s been doing that since his career began in 1966. Since then, Pat Thomas has reinvented himself musically several times. He’s recorded everything from big band highlife in the late sixties, right through to the burger highlife of the early eighties. Since then, Pat Thomas’ has continued to reinvent himself musically during a long and illustrious career that has spanned six decades. Nowadays, Pat Thomas is a Ghanaian highlife master Pat Thomas, who is known as the “the golden voice of Africa.” Now aged sixty-six, and one of the veterans of African music, Pat Thomas continues to make music. That’s no surprise. That is all he ever wanted to do. The Pat Thomas story began in 1940, when he was born in Agona, in the Ashanti region of Ghana in 1951. Music was in Pat’s blood. His father taught music theory, his mother was a bandleader and Pat’s uncle was the legendary Ghanian guitarist King Onyina. 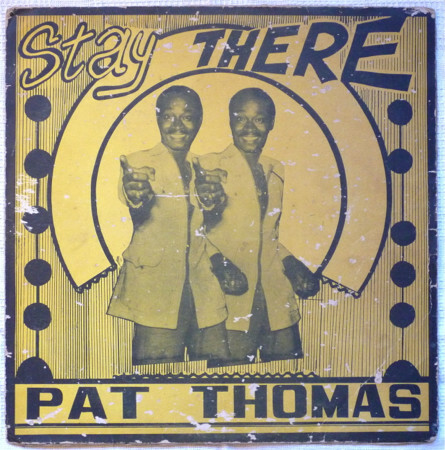 Given his background, it wasn’t surprising Pat Thomas would later make a career out of music. Especially since Pat Thomas was surrounded by music. Growing up, he listened to all types of music. However, it was highlife that struck a nerve with Pat. By the time he was in high school, Pat Thomas dreamt of singing highlife. However, he was too young. This wasn’t going to stop Pat Thomas embarking upon a musical career. So while he was at high school, Pat Thomas started singing covers of songs by Stevie Wonder, Nat King Cole, Miriam Makeba and Jimmy Cliff. While this wasn’t ideal, it was a start. He knew everyone had to start somewhere. The next chapter in Pat Thomas’ career began in 1966. Pat was only fiteen, but something of a musical prodigy. This was in part, thanks to his uncle. He took Pat under his wing. Soon, he was able to write music, and play guitar and drums. However, it was as a singer that Pat Thomas excelled. Already he was a familiar face in local clubs, and was perceived as one of the rising stars of the local music scene. That’s why he was hired as an arranger by one of the biggest names in Ghanian music, Ebo Taylor. Ebo Taylor had just returned from London, when he hired Pat Thomas as an arranger. He and Fela Kuti had been studying music in London. Now Pat was home, he was determined to put what he had learnt into practice. This included modernising highlife. With Pat Thomas onboard, Ebo Taylor embarked upon a journey that eventually, would see the transformation of highlife. It was a meeting of minds. They gave highlife a Western twist. Horns were added. So were guitars and vocals. This once traditional form of African music was about to be transformed by two of Ghana’s most progressive musicians. Over the next few years, Pat Thomas and Ebo Taylor played together in various bands. This included the Stargazer’s Dance Band and the Broadway Dance Band. Pat was the arranger and vocalist, while Ebo played the guitar. They were a formidable duo. That’s apparent on the Pat Thomas penned Go Modern, which the Broadway Dance Band released as a single on the Ambassador label. It wasn’t just Pat’s recording debut as bandleader, but his first recording with Ebo Taylor. However, despite their close friendship, Pat Thomas made the decision to journey to Britain. He wasn’t the first African musician to make this journey. Nor would he be the last. Pat made the Journey to London in 1970. During the time he spent in London, he toured with the Uhuru Dance Band. Then in 1971, Pat returned home and moved to Accra. That’s where Pat Thomas and Ebo Taylor renewed their musical partnership in 1971. That’s when Pat joined the Blue Monks. Again, Pat was the vocalist and Ebo the guitarist. 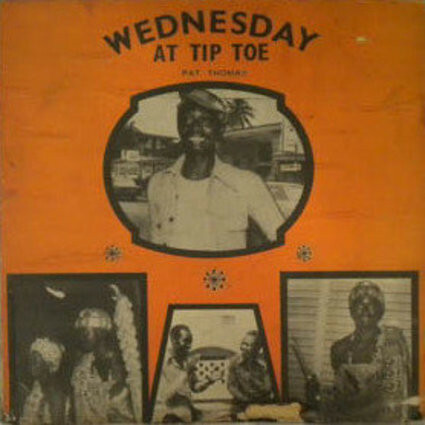 They were resident at the Tip Toe Nite Club, where the Blue Monks would make their mark on Ghanian musical history. They’re now remembered as one of most important and influential Ghanian bands of the early seventies. Just like before, Pat and Ebo went their separate ways, but would later reunite. 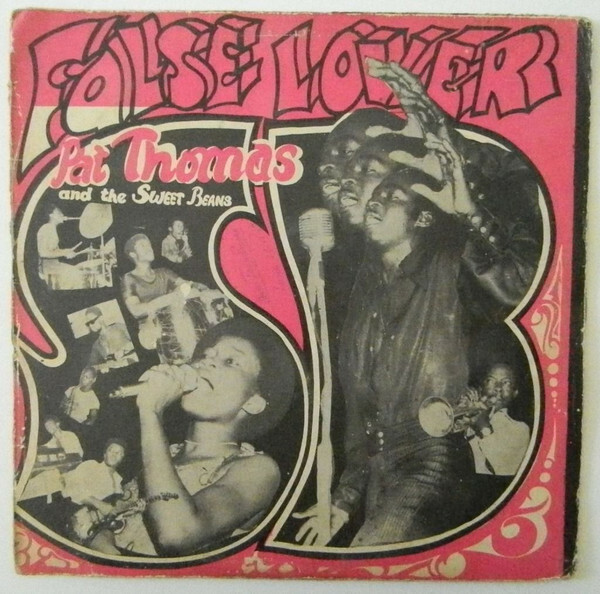 Before that, Pat Thomas and The Big 7 released a couple of singles, including Eye Colo in 1972. It features on the Coming Home-Original Ghanian Highlife and Afrobeat Classics compilation, and is a reminder of what was a memorable collaboration. They reunited in 1973 to record and release Okomfo Bone as a single. However, the collaboration between Pat Thomas and The Big 7” wasn’t particularly successful, and they parted. Not long after this, Pat was on the move. This time, Pat Thomas moved to the Ivory Coast. After a while, Pat decided to return home, and once more, reunited with Ebo Taylor. In 1974, they joined Sweet Beans, a group sponsored by the Ghana Cocoa Board. Later in 1974, Pat Thomas had recorded an album with The Sweet Bean. They were billed as Pat Thomas and The Sweet Beans, and their album False Lover was released on Gapophone Records later in 1974. Three of the songs Pat had written for the album, were Merebre, Revolution and Set Me Free. Sadly, Pat Thomas and The Sweet Beans only released onealbum. However, for Pat Thomas, this was just the start of his recording career. Around this time, Pat Thomas recording career was blossoming. However, details of exactly where and the recordings took place is unclear. Even debates surrounds the exact release date. It’s thought that The Ogyatanaa Show Band (Super) Yaa Amponsah and Pat Thomas and The Black Berets Obra E Yebo Yi were released in 1974. Similarly, it’s thought that Pat Thomas cut and released Awurade Mpaebo in 1975. Alas, over forty years later, details are somewhat sketchy. The main thing is that the music has survived, and shows Pat Thomas maturing and evolving musically. 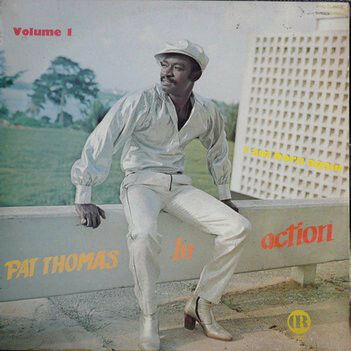 Having released two solo albums during 1976, Pat Thomas released his live album Wednesday At Tip Toe. That night his performancewas recorded for posterity, and released on Gapophone Records. This was fitting, as Pat had often took to the stage at Tip Toe, when The Blue Monks had a residency. The other album Pat worked on during 1976, was his first collaboration with Marijata. 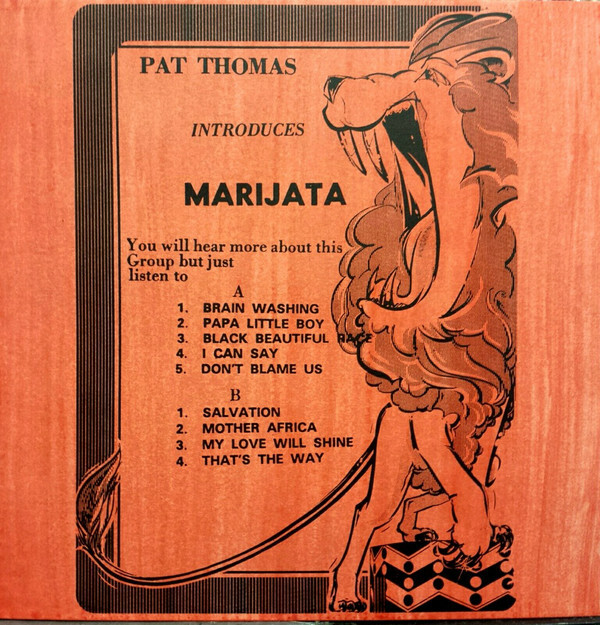 This was Pat Thomas Introduces Marijata, which was released on Gapophone Records, in 1977. The followup was Pat Thomas and Marijata, which was released in 1978. After that, Pat decided to concentrate on his solo career. That was the plan 1978. However, Pat Thomas was reunited with Ebo Taylor in 1978. Soon, they embarked on a collaboration with another legend of African music, Fela Kuti’s former drummer, Tony Allen. At the time, Pat Thomas, Ebo Taylor and Tony Allen were at the peak of their powers. They were like an African supergroup. The collaboration came about when Tony Allen was rerecording the soundtrack to Black President in Accra. When Tony had some downtime, he headed to Kumsai to record with Pat and Ebo. Sadly, the sessions never saw the light of day, after they were destroyed in a fire. Sadly it would be, four decades later, before Pat Thomas would collaborate with his old friends. Later in 1978, Pat Thomas returned with the first in a trilogy of albums, In Action Volume 1-I Am Born Again. The followup, In Action Volume 2-Asante Kotoko was released a year later. in 1979. So was the final instalment in the trilogy, In Action Volume 3-I Wanna Know. By then, Ghana was a troubled country. Ghana was in the throes of a coup d’état lead by Flight Lieutenant Jerry Rawlings. Many Ghanians fearing their safety, fled the country. Those that remained, their lives were in danger. Nothing was sacred. To make matters worse the military junta set about destroying the Ghanian music industry. They went as far as destroying the master tapes in Gapophone Records’ vaults. Musicians like Pat Thomas looked on helplessly. They were determined not to be silenced. However, they were realists, and knew that it they stayed in Ghana, their loves were in danger. So later in 1979, Pat Thomas left Ghana, and headed for London. London was only a temporary home for Pat Thomas. He moved to Berlin, where he hooked up with other Ghanian musicians. Augmented by some local musicians, they recorded the album 1980. It featured an eclectic mixture of Afrrobeat, disco and reggae. 1980 became one of the early records of burger highlife scene. This came about, after Ghanians living in Germany became to call themselves burgers. In doing so, a new musical scene was born, and Pat was at the centre of it. Things were improving for Pat Thomas, after the move to Berlin. He released Asawo Do was released as a single, and it gave Pat a hit in Germany and Ghana. Belatedly, Pat’s music was finding a wider audience. This made it the perfect time to for Pat to release his collaboration with his old friend Ebo Taylor. Pat Thomas and Ebo Taylor had recorded a truly eclectic album, Sweeter Than Honey Calypso ‘Mahuno” And High Lifes Celebration. With a hugely talented band, they fused elements of Afrobeat, calypso funk, highlife, reggae and soul. Alas, the album didn’t sell in huge quantities. Although was disappointing, Pat soon, began work with a new band, Super Sounds Namba. Pat Thomas joined another band comprising Ghanian musicians, Super Sounds Namba. They headed to Otodi Studio, in Togo to record their one and only album Super Sounds. It was released in 1981, and nowadays a collectors item. One track that proved poignant was Who’s Free, given the political situation in Ghana. The people who hadn’t fled Ghana certainly weren’t free. They lived under military rule. Musicians who were seen as subversives, who spoke against the government and now military rulers, couldn’t live safely in Ghana. Pat Thomas realised that in 1979, and fled to London. Since then, he had moved to Berlin, but his life was in a state of flux. He couldn’t return home to the political situation changed. For Pat, this was a worrying time. Still, though, he continued to make music. In 1982, Ebo Taylor, Pat Thomas and Uhuru Yenzu collaborated on the album Hitsville Re-Visited. Accompanied by an all-star band, this Ghanian supergroup won friends and influenced people when the album was released in 1982. The following year, Pat released another solo album. 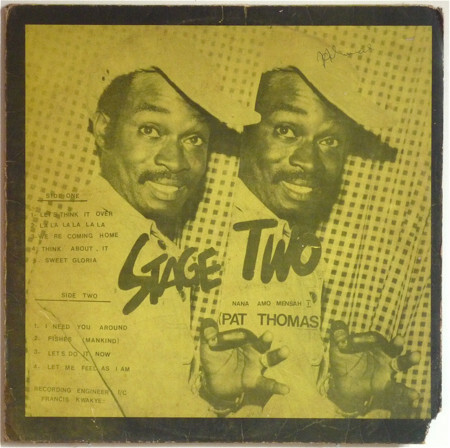 Pat Thomas released In His Style From London-Hot and Cool Highlife in 1983. This was the second live album of Pat’s career. It had been recorded while Pat was touring in 1983. A year later, Pat released an album with one of his oldest friends, Ebo Taylor. 1984 saw the release of Pat Thomas and Ebo Taylor released another collaboration. This was their eponymous debut album. It was released on Dannytone Records and featured two of Ghanian music’s most influential musicians. They had been working together on and of for eighteen years. So it was no surprise that they produced an album that was released to critical acclaim. However, the last few years hadn’t been easy. Both men were exiles. Despite this, Pat was about to enter the most productive period of his career. Between 1985 and 1988, Pat released four studio albums and a collaboration. The first of the studio albums was Asanteman, which was released in 1985. Highlife Greats Mbrepa followed in 1986. By then, Pat Thomas’ star was in the ascendancy. He was a star of the hamburger highlife scene. Everything was going well for Pat Thomas. Despite this, pat made the decision to leave London behind. He moved to Canada, which was home for Pat Thomas for the next ten years. Now living in Canada, this productive period continued. In 1987, Pat released Pat Thomas and Friends and his solo album Santrofi. The following year, 1988, Pat released a new solo album Me Do Wiase. It was around this time Pat released his Mpaebo album. This was the last album Pat released during the eighties. Three years later, and Pat Thomas returned with a new album, Sika Ye Mogya in 1991. This was the last album Pat released for five years. No longer was Pat as productive as he had once been. However, in 1996 Pat returned with Nkae, which was his Canadian swan-song. Soon, he would be returning home. Pat Thomas returned to Ghana in 1997. Soon, Pat Thomas was back where he belonged, at the top of the Ghanaian music scene. His comeback was complete in 2008, when he starred at the Made In Germany burger highlife festival. However, since then, Pat Thomas has stayed and played in Ghana. 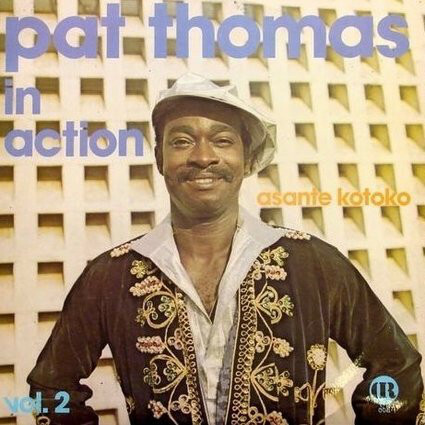 While his old friend Ebo Taylor has travelled overseas, and had reinvented himself, becoming an international star, Pat Thomas was happy to remain in Ghana. He had spent eighteen years living overseas. Now he was home. Although he wasn’t playing live as much as he once had, he was still in demand for gala dinners and corporate functions. Nor had Pat recorded an album for a long time. However, in 2013, he got the chance to return to the studio. Tony Allen got in touch with Pat Thomas and Ebo Taylor. He wanted to record an album with them. Pat and Ebo were just as keen. So in January 2014, the three men headed to a studio in Accra. They were joined by what can only be described as an all-star band. Among the all star band was drummer Tony Allen, bassist Emmanuel Ofori and guitarist Ebo Taylor. They were joined by percussionist Eric Owusu and saxophonist Abaranel-Wolff. He co-produced the album with multi-instrumentalist Kwame Yeboh.. They provided the backdrop for Pat Thomas’ vocals. The resulting album became Pat Thomas and Kwashibu Area Band’s eponymous debut album. This was just the latest album Pat Thomas’ long and illustrious career.